2018 has been quite the year for metal as a whole. With big releases from big bands hitting all the high notes, and several subgenres experiencing some of their most consistently impressive output in decades, it’s fairly safe to say that this has thus far been a premium year for the genre. But while metal as a whole has experienced a vast array of quality content, some subgenres seem to be contributing more than others. Black metal, in my estimation, is one of those less fruitful branches of the metal tree thus far in 2018. This makes me sad. Why is this happening? Has black metal lost its edge? I don’t necessarily think that’s the case. 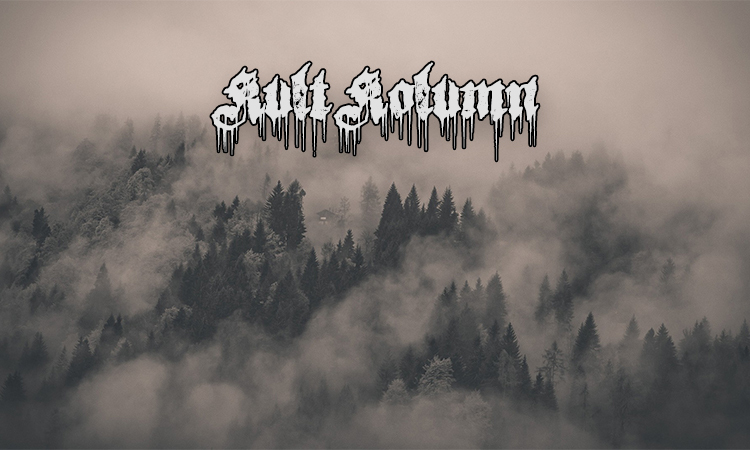 While not releasing excellent material at the same rate as death metal (which, if we’re being fair, is a hard act to follow these days), there have been plenty of solid black metal releases thus far this year. Take a look back at our previous months work here in Kvlt Kolvmn for ample evidence of that. The problem, to me, lies at least in part with black metal’s lack of a legitimate heavy hitter of a release. With Deafheaven moving further and further away from their blackened roots, the music’s popular appeal is dwindling at an accelerating rate. Plenty will claim this a net positive, but the outlook of the subgenre in many ways depends on its biggest bands producing noteworthy records that achieve some level of popular consumption. Last year gave us releases from Thantifaxath, Krallice, Bestia Arcana, Nightbringer, Yellow Eyes, and a slew of other great bands that, while not necessarily the biggest names in black metal, brought deep levels of invigoration for the black metal fan. This year? Not so much. Additionally, it doesn’t help when the musicians playing and writing the music land decidedly on the wrong side of the cultural zeitgeist. Mired by constant controversy, some of the subgenre’s most popular acts (Watain, Taake, Inquisition, and a host of others) have taken it to the chin this year. Frankly, it hasn’t been a great year for black metal on the whole, and July does little to change that. Nevertheless, there is good music to be found in the rubble heap of black metal’s first half of 2018. Scott and I expound on some of these releases below, including a surprisingly delightful record from a legendary band that lives up to the hype of its name, hopefully heralding a turning point for the subgenre in 2018. One can only hope. Regardless of its immediate state, black metal remains the ever-elusive enigma it has always been, and that alone is worthy of continued praise. Partake in the darkness, and stay frosty. The history of Immortal has not been immune to big changes. But perhaps the most significant of these fluctuations came with the departure of guitarist and principal songwriter Abbath. Having laid dormant as a band for nearly a decade, it wouldn’t be too far-fetched to assume that the band’s next record (if that ever came) would be an absolute disaster. Bent on satisfying our morbid curiosity, Immortal unleash Northern Chaos Gods upon our expectant and eager ears. Is it as bad as it could/should be? No. Quite the opposite, actually. The band’s ninth full-length record and first in nearly a decade, Northern Chaos Gods is actually a damn fine record. Their best since 2002’s Sons of Northern Darkness. This may come as a shock, but in hindsight I’m not exactly sure why. Sure, circumstances have not been particularly kind to the band and their brand over the past few years, but the amount of talent Immortal has always possessed should indicate a successful transition of power. With Demonaz taking over guitar, songwriting, and vocal duty for the first time since 1997’s Blizzard Beasts while Horgh continues to hold down the kit, Northern Chaos Gods brings back the flaming fury of the bands earliest releases, culminating in song after song of fantastic black metal aggression. The opening and title track is a furious blast of premium black metal that goes as hard as most anything in the band’s catalog, and “Into Battle Ride” is no different, galloping through riff after icy, frostbitten riff with the verve of Gorgoroth. Which is all fine and good, but the band have never been exclusively the slash-and-burn type. Thankfully, their more melodic and atmospheric side is still intact, with tracks like “Gates to Blashyrkh” and “Where Mountains Rise” placing the band’s more nuanced songwriting on full display. These elements of the band’s sound are most prominently shown in album finale “Mighty Ravendark”, which is far and away one of the most thrilling tracks the band have written. In all, Northern Chaos Gods is a logical, masterful recollection of the elements that have made Immortal so special over the past few decades, with few if any duds in the bunch. It’s not a particularly ambitious album. It’s not a perfect album, either. Which is fine, because it absolutely doesn’t need to be. Northern Chaos Gods is an unexpected, dynamic return to form for one of black metal’s most treasured bands. Savor the frostiness while you can. Here’s hoping for another bout of hopelessness from these black metal masters very soon. Mesarthim confuses me. Maybe I’m the only one, but yeah. I don’t get it. But I like it, that much is certain. When I first heard Isolate back in 2015, I thought that this most cosmic of atmoblack projects showed a lot of promise. Its second full-length proved even more invigorating for me, propelling me to a level of moderate hype. Four EPs, a compilation record, and another full-length later, it’s hard to keep track of what is even happening in the world of Mesarthim. Coma Wall, the latest EP in a line of many, is one 16-minute track of blackened, synth-heavy atmospheric aggression. It’s also pretty great. Blasting off with a whole lot of static, Coma Wall quickly jumps into a synthy melody before some pretty gnarly guitar work sends the whole track into orbit. All this in the first minute. There’s a lot going on here, and admittedly it took me a bit to absorb and process what was happening. But give this track the time and attention it obviously deserves, and like me you may find yourself transported. The melodies here are immensely catchy when given space to sink in, and the rabid vocals add a significant amount of dramatic heft to the proceedings. It’s a track that doesn’t like to sit still, propelling itself forward at warp speed into even denser and more melodically rich cosmic spaces, culminating in one hell of an emotional finale that will leave you spent. If your vision of traveling through space is that of an awe-inspiring, violent, and chaotic journey through the void, you have found your soundtrack. I may not fully get what Mesarthim is going for, but when this project is good it’s VERY good. Coma Wall is one of those moments. As the releases keep on coming, here’s hoping that the quality of the material remains this high and ambitious. Satisfying, entrancing stuff. Genre oxymorons are a dime a dozen these days, and about penny’s worth of those actually pull through with an accurate portrayal of their proposed synthesis. Black metal’s a somewhat rare cased where post-black metal has thrived based on supposed odd bedfellows (I’d argue that the gaps between black metal, post-rock and shoegaze are much more slight than they seem). So after seeing “alternative rock” and “black metal” used in the same breath, I figured Moonfrost would be an interesting listen that leaned more in one direction than the other. Not only was I dead wrong about III, but I unexpectedly found one of the most unique black metal albums of the year. Moonfrost embrace the dichotomy of “blackened alt-rock” without tripping into parody or excess. Despite toying with a formula destined to fail, III is a truly inventive album that feels completely grounded in a logic where none was projected to be found. Right from the start, opener “Too Drugged to Dream” is immediately attention-grabbing and remains that way through all its twists and turns. The initial chords feel like a Foo Fighters riff written after Dave Grohl fully embraces his inner metalhead, and .ven’s blackened snarls somehow stomp through the proceeding without missing a beat. The track naturally darkens and embraces its black metal core, but the general theme and compositional builds draw from these surprisingly fitting alt-rock riffs and progressions. “Frontier Spirit” starts with some angular, post-something guitarwork that feels difficult to place but familiar and captivating. As it weaves through blackened landscapes, the track becomes increasingly catchier and more multifaceted. A couple tracks later, “Obsidian” illuminates some of the band’s key influences, with a melodic, subtly reverb-laden sonic stroll through the worlds of Slint and Alcest. Of course, the black metal is only a guitar pedal click away, and it blends in perfectly as it always does on the album. As the record progresses, the listener falls in line with the band’s formula more and more closely, and as the mystique of the album becomes charm, Moonfrost’s approach to songcraft becomes exciting rather than quaint. Every guitar lick and drum pattern from a seemingly far-off world makes III that much more of a highlight for black metal this year, and I’m genuinely glad I didn’t shrug the album off as a potential case of false advertising. As odd as the marriage of alt-rock and black metal may sound, by the end of III, it feels like a combination that should have been explored in this way long before now. Perhaps I’ve been missing out on an underground movement exploring these styles and how they interlock, but until I stumble upon such a trend, I’ll happily continue spinning Moonfrsot’s work over and over again. It’s always interesting to think about just how “new” a band’s latest release is by the time it sees the light of day. Of course, pretty much all new music is likely close to at least a year old by the time it reaches the recording booth and pressing plants, but often times those ideas have been fermenting for years. Sunwalker, for example, was written way back in 2013, the same here Morphinist convened as a band. Given the release’s mammoth one-song, 40.5-minute runtime, it’s no surprise the project took a half-decade to see the light of day. But I opened this blurb the way I did to highlight just how perfectly timed Sunwalker is given the modern musical landscape. The phenomenon of the minimal-track, long-song setup found a landmark moment with Bell Witch‘s phenomenal funeral doom opus Mirror Reaper. For this reason, I feel Dawnwalker will seem less frightening to the average metal listener, given how song length has become more of a non-issue over the years. But more importantly, Morphinist should win over black and doom fans with their refined yet organic songwriting, which is on full display throughout Dawnwalker. Of course, the lengthy runtime will still be a deterrent, but I can assure hesitant listeners that Dawnwalker progresses naturally and won’t send you checking your phones for the time. The release has the epic magnitude of a 405.minute release while still retaining the pacing and dynamic development of a standard album. Musically speaking, Dawnwalker is about as seamless a marriage between black and doom metal as you can get, with a prominent undercurrent of atmosphere and fresher songcraft. As the band’s excellent, modern artwork suggests (courtesy of L’Hérétique), Dawnwalker isn’t your father’s blackened doom metal, which often felt more like an evil, kvlt trudge. Instead, Morphinist sound almost relaxed at every moment on the release, completely comfortable taking their time to establish their sound and allow the black and doom influences to reveal themselves on their own. The result is a strong offering from a band that understands its key subgenres while also maintaining a strong grasp of where they should take it next.